………. CLICK HERE TO PLAY VIDEO ………..
400 million year history: Ashfield Stone is a mica garnet Schist. Schist is a naturally layered stone having been folded up from ancient seabed and metamorphosed in the slow crush of continents some 400 million years ago. The Crowsfoot Schist was originally the molten core of ancient volcanos metamorphosed. The layers that comprise this schist are thin and fine like filo pastry. 300 year history: This wonderful and versatile stone has been used traditionally for centuries in it’s chisel split or cleft form. All of the oldest gravestones, doorsteps, walls, walkways, patios, doorsteps and hearths in this region have been fashioned from this stone. We are still splitting this schist for these applications, today. 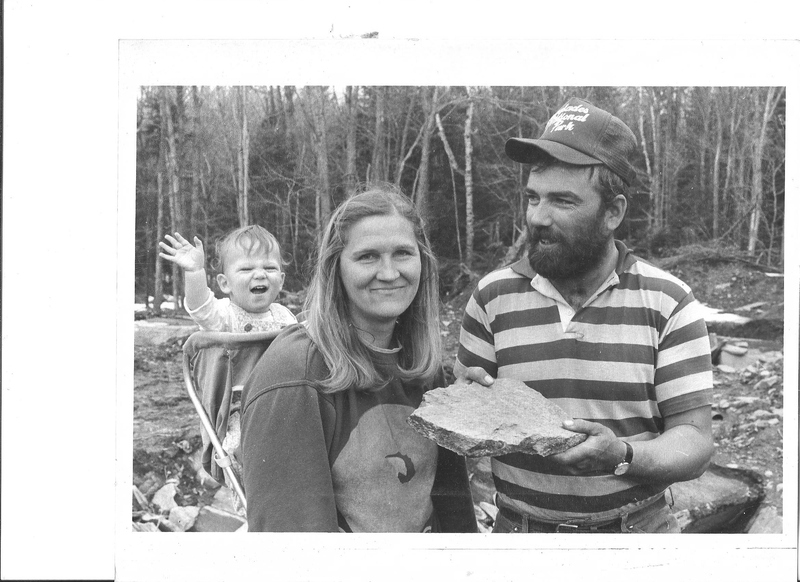 27 plus year history: We purchased the land in Ashfield Massachusetts in 1984 with the intention of clearing some of the woodland and building our home and barns with our own materials. We were friendly with a neighbor, Ted Howes, an octogenarian, who took an interest in our plans and who had a wealth of history of the area to share with us. He became a dear friend and mentor over the years. Early on he told us that his grandfather, Robert Howes, had once owned our land and had used it as a woodlot. Ted recalled a story that his grandfather told that he had once paid a man $16 to draw out some of the wonderful flat stone from a ledge there with a team of oxen and a stone boat and deliver it for use in his barn cellar (this was pre-cement in the late 1800′s). This fact intrigued Jerry and he explored the woods for the source of this flat stone when he wasn’t cutting logs to be milled for lumber for our house and barns. When he finally found the ledge, he cleared it back of topsoil and roots, purchased some hand chisels and learned to split the stone into its silvery layers. This was in the late 80′s. The country was into a recession, the construction business was slow. Johanne had given birth to their daughter and left her teaching position. Jerry had used some of the split stone in a small residential project in Old Deerfield and the clients and their neighbors were very taken with the stone. Slowly, the idea of actually quarrying the unique natural resource in our backyard took hold. In 1988 we went to the town and got our permit to open our quarry. Jerry and one employee learned to read the stone and split it along its natural layers with hammer and chisel. We sold wall stone, patio stone and doorsteps. We purchased an old dump truck and made deliveries. Soon we were hiring and training more men and subletting out the trucking. The business grew as the public’s taste for natural stone in their landscapes and gardens grew. We were (and continue to be) the subjects of a lot of press. The story of finding and profiting from a natural resource in your own backyard makes for interesting reading. This free advertising was a boon to our business. We were written up in Yankee Magazine, local newspapers and have been featured on two television shows: Home and Garden TV and recently, The Discovery Channel’s Planet Green/ Renovation Nation show with Steve Thomas from this Old House. He spent a half a day here filming our operation and emphasizing the “green” elements of our product and production. In 1991, Jerry wondered what else we could do with this stone besides splitting it for landscaping. Winters were long as we would close the quarry from November to after mud season, in April. Summer was the season for landscape stone. 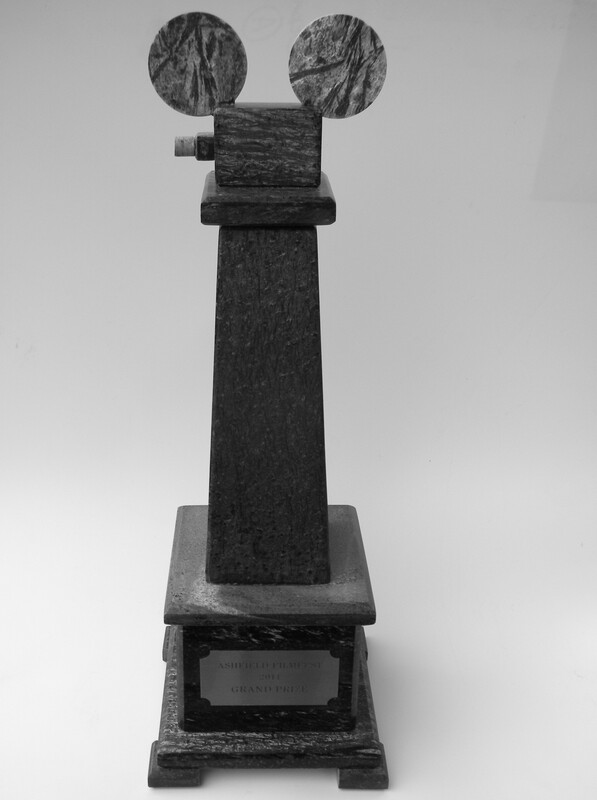 He brought a block up to the granite town of Barre, Vermont and found a fabricator willing to cut and polish a piece. The results were stunning. We had more cut and finished and soon a famous sculptor, Michael Singer from Vermont heard about us and introduced us to the well known Boston Architectural firm of Kallmann, McKinnel and Wood. This firm was looking for a stone to be included in their design for the Beckton Dickinson Corporate Headquarters in Franklin Lakes New Jersey. They chose our stone to be incorporated into the forecourt. We contracted with a saw house in Barre to saw and finish our stone. This was a huge project for us. Following right on the heels of this project came another flooring project designed by a revered architect who teaches at Harvard University named Raphael Manao. This was the entry hall floor for the new Davis Art Museum at Wellesley College. Both of these projects were very large and very prestigious. We learned so much from these initial projects. The primary lesson was that we wanted to control the cutting and production of our stone in- house. We mortgaged our home, got a CDC loan and commissioned two bridge saws to be built in Barre, Vt . We retrofitted our existing barn to become our fabrication facility. This shop was completed in 1992. We gradually outgrew this small space and the saws were getting tired. In 2011 we made the decision to build a new state-of-the-art fabrication shop. You can read about our new shop under the Architects and Designers page. Right from the beginning we recognized the importance of a good relationship with our community. We strive to be good neighbors and we have had a continuing policy of stone donations to the town of Ashfield and the surrounding communities. We recently donated memorial benches to the Ashfield Plain Cemetery for the war memorial. We donated the war memorial for the Town of Charlemont. Currently we are working on a large stone slab that will have bronze plaques mounted as a war memorial for the Town of Buckland. 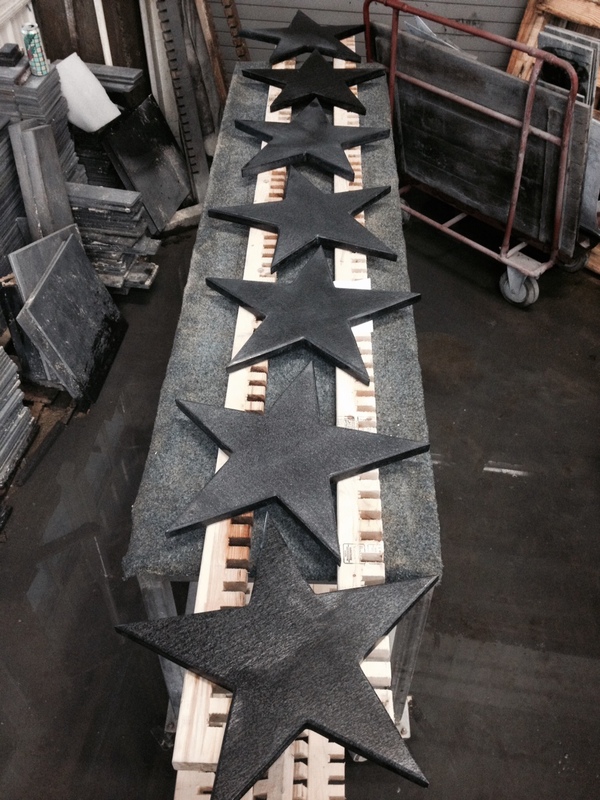 We were invited to produce stone pavers that will be used to represent Massachusetts in a 50 state stone walkway that will wind through Phoenix Park, a memorial for the people lost from the attacks on the World Trade Center. We enjoy making and donating schist platters for local, non-profit auctions. We design and fabricate unique prizes for the local film festival, trophies for the Berkshire Highlands Penthalon and stone stars to mark film locations in the village that were used in several major motion pictures.These are just a few of the many ways we have given back to the region for their support and pride in our local stone. In the beginning…28 years ago! Some of the fun stuff…..